When I woke up this morning, I remembered there had been an (important?) election yesterday and asked someone who won. I was not surprised in the least. I’m not a political correspondent. I don’t live in Massachusetts. But you don’t need to be either of those to know why Brown (a Republican) beat Coakley (a Democrat) to take the Senate seat formerly held by Ted Kennedy in (what the NY Times calls) “the overwhelmingly Democratic state of Massachusetts.” You just need to follow the political system a little bit these days. While there may have been such a thing in the past, we’re past that. Sure, people my have liberal or conservative views, but for the most part, people don’t care what party label the person carries on the ballot. The first example came in the 2008 election. Barack Obama won many “formerly Republican” states. I say no, these weren’t “Republican states,” but instead states that had previous voted in the majority for the Republican presidential candidate. Secondly, the current “tea party” people. Many would say they’re Republicans who are mad at their party. I say no, these are conservatives who no longer see enough Republicans championing the issues and values that are important to them. In the special election in New York’s 23rd congressional district in November 2009, you actually had the officially endorsed Republican candidate drop out after massive pressure by a conservative, “tea party,” challenger backed by people like Sara Palin, Rush Limbaugh, and Fox News’ Glenn Beck. People can no longer be counted on to vote a “straight party ticket,” as they call it, for people will choose to vote as they see fit (see reason #3 below). Again, I’m not a political correspondent, but if you followed the news stories before the election, you know this to be true, and it was definitely a factor in her loss. Obviously, she was counting on the “party support,” but as I said in reason #1, that doesn’t exist any more. It seems to me that recently, voting has become not a way to select what you want but a referendum on what you don’t want. Since I can recall, I’ve been told that voting is the way to “make your voice heard,” and I’m sure millions of others have been told the same thing. While this is definitely true, voters are now using this in a new way, a way that really fuels the fire they’re trying to put out! Underlying voter habits the past 5 or so years has been an overwhelming feeling that government is broken, and it needs fixed. Thus, the remedy, it’s been decided, is to get rid of all the people in Washington (and maybe the state capital, too) and get new people in there who will surely do a better job. Instead of focusing on how to work with the government already in place (when was the last time YOU called your representative? ), the general consensus has been to just get rid of what’s there and start over. That’s why there was so much turn over in the recent fall 2008 and 2009 elections. The problem comes in the disconnect between the reasons voters are making their choices and the way politicians, our elected officials, interpret them, as I don’t think politicians are getting the message. Let me simplify this, again with a few points. f. If nothing changes, voters continue to be upset and the cycle continues. … their jobs depend on it! Until politicians get the picture that no one is safe and voters aren’t afraid to continue turning over the name cards on office doors in Washington and state capitals, no one is safe. The “Obama brand of politics,” where you try to get support from conservatives and liberals alike, doesn’t work when he’s the only one playing — and unfortunately for Obama, he’ll suffer, too, if no one else joins in. Perhaps, when all is said and done, the change really needs to happen here, or else there really won’t be any change at all. Politicians aren’t dumb people (no matter what you believe), and part of their job is doing what it takes to get reelected, and in most cases, that means making the constituents happy! The “whatever it takes” mentality is obvious in politicians switching parties, as well as recent retirements by those who feel they couldn’t win anyway. Elected officials do listen to their constituents — if only because they want to get elected again! They may not believe everything they have to do, but that’s not the point, the point is that they act on behalf of their constituents. Unless we, as voters, communicate with them, they can’t do that — and just voting them out for disapproval isn’t how it’s going to happen. It takes some energy, but just because the end results didn’t come out how you, the voter, wanted them to, doesn’t mean your rep is personally doing a bad job and needs to be axed. Voters need to recognize this when they go to the ballot box instead of holding a “get rid of them all” mentality when things don’t go as they hoped. OK, so there’s a lot of room for discussion here. Please have some! So while I’m sure this kind of switch-a-roo may have already happened on photoshop in various forms, when I was driving down a rural Ohio road Friday afternoon, I saw this sign in a yard and just busted out laughing and decided I must turn around and snap a picture. 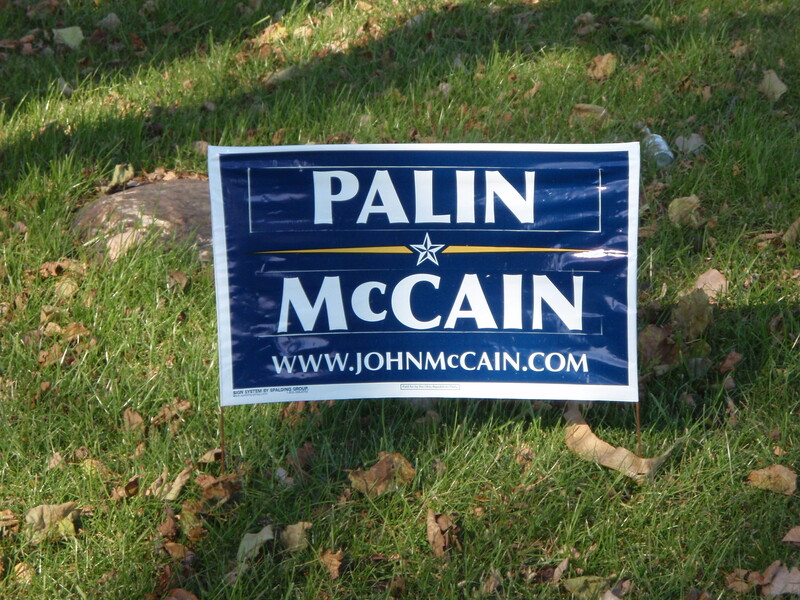 At first I thought that the campaign had actually created this sign, which seemed ludicrous, but then I realized that if one looks closely, you can see this supporter has carefully removed each name from its previous location and reversed the order, putting Mr. MCain as the under-card. I’ll let you be the judge of interpreting what exactly this means, both for the person whose yard this can be found in, and for this election as a whole. Feel free to comment and link this page as desired. I was preparing to write my mom an e-mail and ask her if this was viable (logistically, not if she thought it would be a good idea, though it would be a good question, maybe, too), and if so what I would have to do to get my name on the ballot, but instead I found a little bit of time to surf the Internet and find out for myself. And actually once I found the right combination of words to use in my search engine of choice, I soon arrived at the answer that my name, in fact, could not appear on the ballot. Even though I met all the basic requirements, according to the Ohio Election Calendar 2008 (because I would certainly be running, at this point, at least, in the Ohio 5th Congressional District), to be considered for one of the “major” parties, i would have had to have had my petition in 60 days prior to the primary, which was held on 4 March, so I had obviously missed that. Since I did vote in the Democrat primary in Ohio, I am thus currently affiliated with that party, so I couldn’t run as an independent candidate — to run as an independent (and if I run in 2010, I’d maybe go independent in the 5th District), one need only have the paperwork in a day prior to the primary, but that, too, is already passed. — But as history seems to show, a non-Republican seems to fare a bit better in the 5th District when people aren’t voting for president, but this year, you never know.